As mentioned a few weeks back we’re starting a series of weekly podcasts, lasting a month, featuring exclusive live audio from Ken One‘s recent ‘Skratch Evolution 2‘ event. Held at Kichijoji’s Star Pines cafe, this musical evening featured a rather interesting mix of Tokyo’s underground music scenes with scratch DJs, producers and MCs coming together for a series of live showcases alongside some live painting. This was Ken’s second such event, up a notch from the first which was a more scratch-centered affair. 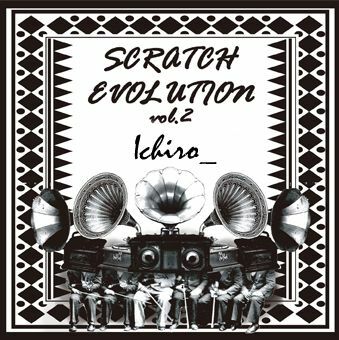 So as you can see plenty to get stuck into, from the laid-back beats of Ichiro_ to the electronic hip hop of XLII via some of the best scratchers on the Tokyo underground. We start on Rhythm Incursions with Ichiro_, a producer based in Tokyo’s Nerima district who I first came across via Twitter (hat tip to Scaloni) and then started to see appear in various other places, including Monday Jazz and most recently on a series of 7″s alongside producer Yoggyone (check our Jan 2010 show for that). Ichiro_ has primarily released on and works with Olive Oil’s excellent Oil Works label. While his approach to the whole beat thing may not be the freshest, he has a certain quality to his beats that I find really interesting, verging on ‘narcotic’ but in a good way. The more I listen to his stuff the more it grows on me, I guess you could say it’s rewarding in its own special way. This live set he performed at Skratch Evolution is the perfect example of this and serves as a great introduction to his work for those that don’t know him yet, featuring primarily his Oil Works material alongside other bits. For more on him be sure to check the myspace as well as the recent joint release with Yoggyone. His Oil Works EP is still available, and I believe Juno still has copies for non-Japan buyers. He also has stuff available on iTunes and a brand new single dropping on Oil Works. Be sure to check the myspace for full link details. Look out for more from him this year, as we’ll definitely be keeping a close eye on his output. And if you like what you hear be sure to head over to Turntable Radio for Ken One’s live session! Massive thanks go to Ken One and all the artists for making this possible. It’s a real pleasure to be able to showcase more of the Tokyo underground to the rest of the world like this. This entry was posted on Sunday, January 24th, 2010 at 2:41 pm. It is filed under Podcasts, Guest Mixes and tagged with beats, Japan, Ichiro_, Ken One, Skratch Evolution, Tokyo. You can follow any responses to this entry through the RSS 2.0 feed.